Freedom, fireworks, and hotdogs all come to mind when thinking about the 4th of July. Each year, 80% of United States citizens attend a BBQ, picnic, or cookout to celebrate Independence Day, and almost just as many gather together with their family. 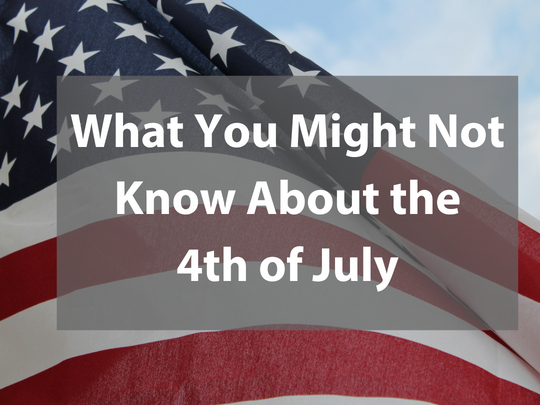 With this festive holiday right around the corner, be sure to educate yourself and impress your friends with some facts you might not have known about the 4th of July. The 4th of July actually denotes the adoption of the Declaration of Independence by the Second Continental Congress and not the signing of it. Congress declared freedom from Great Britain on July 2, 1776. They debated for the next two days over the wording, revisions, and edits to the Declaration of Independence. The main author of this document, which was intended to be the proclamation of freedom to the public, was Thomas Jefferson. It was not until August 2, 1776 that most of the delegates signed the document, and two delegates never signed at all. You won’t be the only one grilling hot dogs this year, on the 4th of July alone, it has been reported that Americans eat 150 million hot dogs. That is enough hot dogs to stretch from Washington D.C. to Los Angeles more than five times. Hamburgers, watermelons, and pies are also popular (and delicious!) food items that are found on the dinner table during the holiday. Food isn’t the only way to celebrate: more than 14,000 firework displays occur across the nation every year. Once the sun goes down, Americans like to light up the sky with colorful and loud explosions. While there’s no celebrations quite like ones you will find in the U.S., there are other countries around the world that celebrate the United States’ Independence Day. From Norway to China and France to Australia, tourists and residents can be sure to find parties equipped with BBQ and the Red, White, and Blue. No matter where in the world you might be celebrating from this 4th of July, you now have some festive trivia to share with your loved ones. Be sure to stay safe, have fun, and make sure to grab a hot dog. Although, at the rate they are being consumed in the United States, you might want to act fast!